New Film: "Lord, Save Us From Your Followers"
Today at the New Wine, New Wineskins conference I had the privilege of meeting a lot of great people, including Dan Merchant, producer of the newly released film "Lord, Save Us From Your Followers." If you were to meet ten average Americans on the street, nine of them would say they believe in God. So why is the Gospel of Love dividing America? Dan Merchant put on his bumper-sticker-clad jumpsuit and decided to find out why the Gospel of Love is dividing America. After talking with scores of men and women on streets all across the nation, and also interviewing many well-known active participants in today’s “Culture Wars,” Dan realized that the public discussion of faith doesn’t have to be contentious. The film opened yesterday in select theaters nationwide, and in its attempt to bring Right and Left together, it reminds me of the film Purple State of Mind. I hope I can find Lord, Save Us.. at a theater in Utah. Update: This book will be available on January 25, 2010 and can be pre-ordered here. 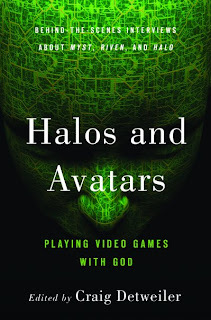 Earlier this year I wrote a chapter for the book Halos and Avatars (Westminster John Knox Press, forthcoming) that touches on video games and digital cultures. The cover is being designed right now. Here's a possibility. What do folks think? This morning various national media outlets are reporting on a National Muslim Day of Prayer in Washington. This is not at all surprising in light of America's religious pluralism, and that minority religious populations are working in the public square for the same types of opportunities of religious expression as the dominant Christian population has had. The Muslim population in America is also becoming more organized and media savvy, and this is exhibited in their desires for a national day of prayer mirroring Christian activities like this. What is surprising is the protest that has been raised against the Muslim prayer activities by Christian leaders and conservatives. Apparently they are calling for these Muslims to repudiate Muslim terrorism during their event, but Muslim spokespersons respond by pointing out that while the acts of terrorism are opposed by their community, it is not appropriate to use a day of prayer for such repudiations. The national day of Muslim prayer, and the protest of Christians in response, is a reminder of the religious pluralism of America and that the conservative Christian community has yet to find a way in which to adequately grapple with this situation. Tomorrow (Wednesday) I leave for Portland, Oregon to meet with the good folks at Multnomah Biblical Seminary to be a guest lecturer on new religions in their world religions class, to meet with their president to discuss theological education, and to be part of a conference put on by The Institute for Theology of Culture. The conference is Saturday. Father Alexei Smith and Robert Millet: "A Mormon-Catholic Conversation on Priesthood and the Sacraments"
Kristine Haglund: "Exploring Trends in Mormon Studies"
Both events will be held at Claremont Graduate University. Their School of Religion's Mormon Studies events web page can be found here. For an alternative treatment of this topic I recommend Philip Johnson and Gus diZerega's dialogue book Beyond the Burning Times which I had the privilege of editing. Readers might also benefit from academic explorations of the topic from my previous interactions with the authors on this blog including The Sign of the Witch, The New Generation Witches, and Teenage Witches. I hope these suggested resources contribute toward more sober analysis by evangelicals this Halloween/Samhain season. 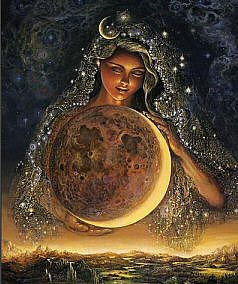 Helen Berger is currently conducting an online questionnairre in order to update her Pagan Census. Pagan readers of Morehead's Musings are encouraged to click this link and to complete the census.